The main dining area at the newly reopened Geno's. A fire in June brought an abrupt end to the previous Geno's era. But as of this month the restaurant is back up and running, now as part of the group of local restaurants that includes the Elk Public House in Browne's Addition and its sister pubs. Aside from the name, little remains of previous incarnations of Geno's. Gone are the pizzas and the eclectic tables and chairs. Gone is the circus tent fabric on the walls. Diners who frequented the spot before the fire will find some familiar touches, but make no mistake: Geno's is now very much a Logan-area outpost of the Elk tradition. "We just cleaned it up a bit and put our spin on it," says general manager Marshall Powell. 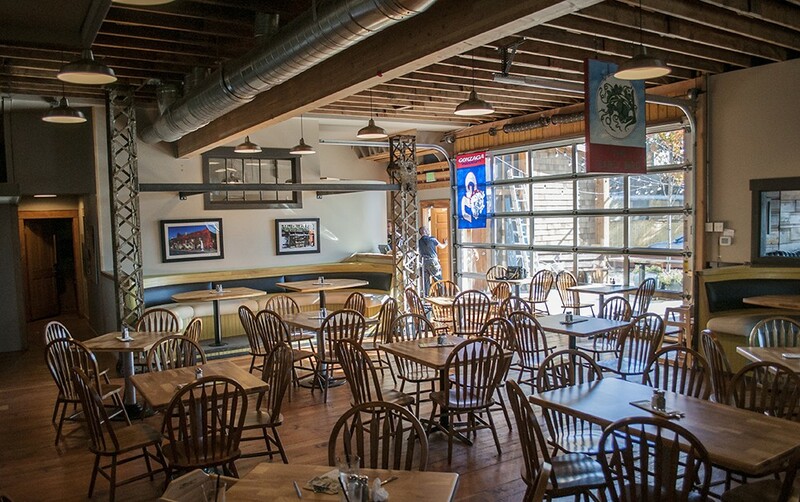 In the Gonzaga part of town, the casual-neighborhood-hangout concept manifests in a prominently placed flat-screen TV and menu items — wings, anyone? — geared toward the game-watching crowd. It's easy to imagine fans packed into the large booths and dim bar to intently watch the game come basketball season. Connected to main dining area with a glass garage door, the inviting patio will be a draw during the warm months. The menu will look familiar to anyone who's recently dined at the owners' other restaurants, with traditional pub fare elevated by eclectic flavors — the aforementioned wings, exclusively at Geno's, are marinated and tossed in a Vietnamese-style garlic sauce with curry dipping sauce ($10). Other new items include the BBQ turkey dip ($9.25) and Korean pork sandwich ($10.50). Vegetarians and those in search of a lighter meal will find plenty of options, like the orange miso spinach salad topped with quinoa, edamame, dried cranberries and toasted pumpkin seeds ($8.50 whole). In response to diners who liked the gluten-free options at the previous Geno's, the menu points out that any sandwich can be made with a gluten-free bun — an option available but not promoted at the other restaurants since earlier this year.